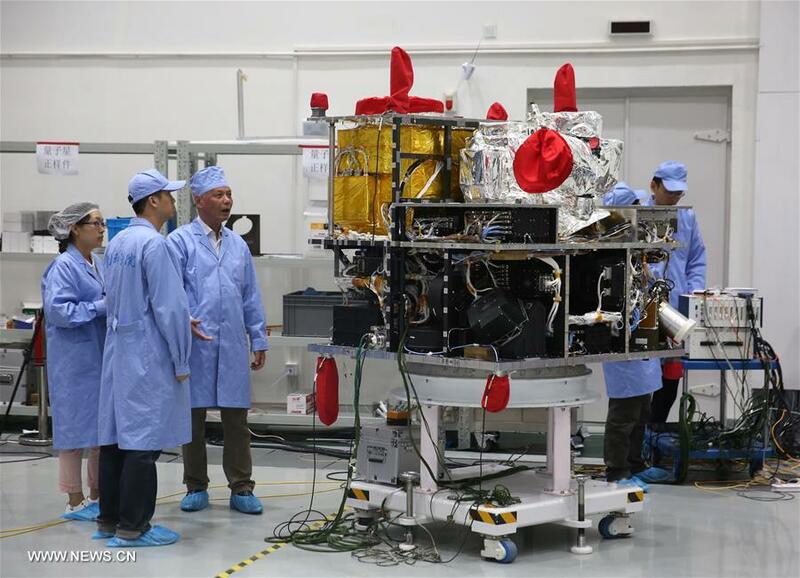 China’s Quantum Science Satellite, nicknamed Micius, is the world’s first satellite mission testing quantum communications technology which is likely to become the cornerstone of uncrackable communications systems of the future. 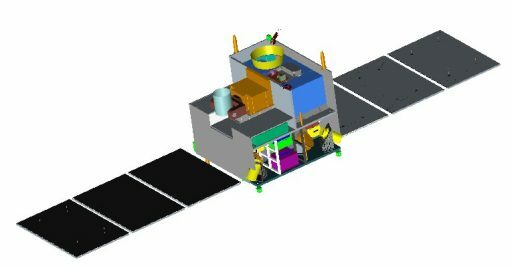 The Quantum Science Satellite (QSS) provides the first space-based platform with long-distance satellite and ground quantum channel, carrying out a series of tests to examine fundamental quantum principles and communications protocols in a full-sized space-to-ground architecture. Completing a two-year mission from a 600-Kilometer orbit, QSS will test long-range quantum communications to evaluate the technology readiness level for a Global Scale Quantum Communications Network. QSS is a project of the China Academy of Sciences with participation of the Austrian Academy of Sciences for a total project value of around $100 million. Space-based quantum communications represent a kind of modern-day space race given the technology will uncover any tinkering and eavesdropping in the exchange of information between two parties – making it attractive for national security needs and intelligence agencies. 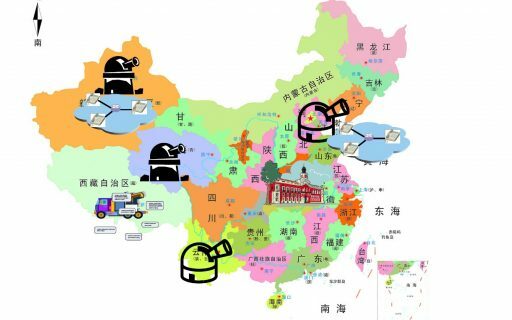 A number of projects are currently being worked on by teams in China, Canada, Japan and Singapore and some progress was made in the field of exchanging information via entangled photons. The U.S. is likely developing quantum communications technology as part of classified national defence projects. Quantum communications between space and Earth are accomplished by establishing a long-distance quantum channel. Data sent between the transmitting and receiving stations can not be copied, stolen or spied on – illustrating why quantum communications have been identified as a criticality in times when attacks on sensitive information have become a threat to the world’s governments and private endeavors. Quantum entanglement is a physical phenomenon in which pairs or groups of particles interact in ways such that the quantum state can only be described for the system as a whole and not for the individual particles part of that system. The measurement of a property of a particle can be seen as acting on that particle and will change its original quantum property which – in case of entangled particles – will cause the system’s quantum state to change. It appears that one particle of an entangled pair “knows” the measurement conducted on the other particle in an exchange of information that can cover any distance. Entanglement is one of the most counter-intuitive features of quantum mechanics because the perfect correlations between entangled systems are in direct conflict with the concepts of classical physics. There are proposed theories that predict quantum entanglement is limited to certain scales concerning mass and length or can be altered in certain gravitational environments. To exploit quantum mechanics for communications, the validity of these theories has to be investigated beyond distances and velocities achievable in ground-based experimentation and in environments were effects of quantum physics and relativity begin to interplay to reveal quantum interference effects that could occur with distances of thousands of Kilometers and speeds closer to relativistic velocities. Quantum encryption can take advantage of quantum entanglement, utilizing it to detect any eavesdroppers entering the communications loop as their presence would automatically cause quantum states to collapse, ending the flow of information and revealing their spying to the operators of the system. The inherit complexity of quantum mechanics makes it impossible to reverse engineer the quantum key encoded in the polarization of a string of photons, providing an ultra-secure means of communication. Classical cryptography does not allow a provable, unconditionally secure key to be generated simultaneously by two separate communicating parties. While the exchange of information through quantum entanglement is perfectly secure, quantum networks are still vulnerable to denial of service attacks, physical tampering with hardware, and typical issues arising with operational security. The primary goal of the QSS mission is to implement a series of communications experiments between the Quantum Science Satellite and quantum communications stations on the ground. The mission will aim to set up an ultra-long-range quantum channel between the ground and satellite, implementing a quantum key distribution for secure quantum experiments. Another experiment will use the satellite as a repeater to connect two quantum ground stations on Earth. QSS will test quantum entanglement over large distances, distributing quantum entangled photons from the satellite to a pair of distant ground stations. This will also put the principles of the non-locality of quantum mechanics to the test. The QSS mission is hoped to demonstrate Quantum Teleportation, a fundamental process needed in quantum communications and quantum computing. This experiment will use a high-quality quantum entanglement source on the ground to achieve ground-to-satellite teleportation. 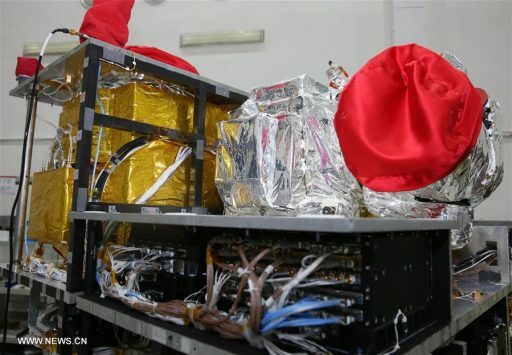 The QSS satellite is a 600-Kilogram spacecraft outfitted with a quantum key communicator, a quantum entanglement emitter, quantum entanglement source, quantum experiment controller and processor, and high-speed coherent laser communicator. Ground-based quantum communications using optical fibers have been demonstrated over distances of a few hundred Kilometers. Photons traveling through optical fibers or Earth’s air-filled atmosphere are scattered and absorbed – requiring amplifiers to extend a signal’s reach which is extremely difficult while maintaining a photon’s quantum state. 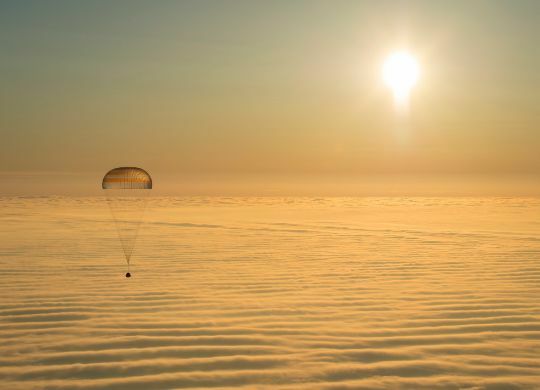 Transmitting signals through the vacuum of space should enable communications over much greater distances. The basic working principle of QSS revolves around a crystal that generates pairs of entangled photons whose properties remain coupled to one another however far apart they are. A high-fidelity optical communications system is then responsible for delivering the partners of the entangled pairs to optical ground stations in Vienna, Austria and Beijing, China where their polarization properties will be used to generate a secret encryption key. QSS is really the first mission to put to the test whether entanglement can indeed exist between particles separated by very large distances as the laws of quantum mechanics stipulate. Teleportation of quantum states will be attempted by using entangled photons plus data on their quantum states to reconstruct the photons in an identical quantum state in a new location. 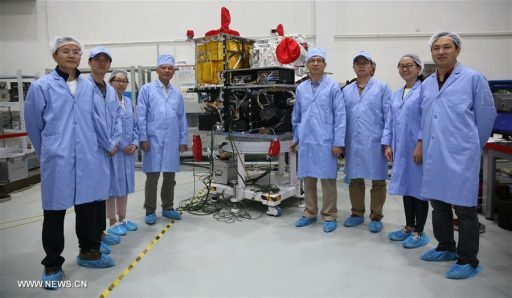 The QSS spacecraft is based on a microsatellite bus that can host payloads of around 200 Kilograms, providing a stable platform with precise pointing capability for ground stations to lock onto the optical carriers from the satellite and vice versa. The basic design work of QSS was finished by the end of 2011, allowing the project to head into mission definition and technology research in 2012. 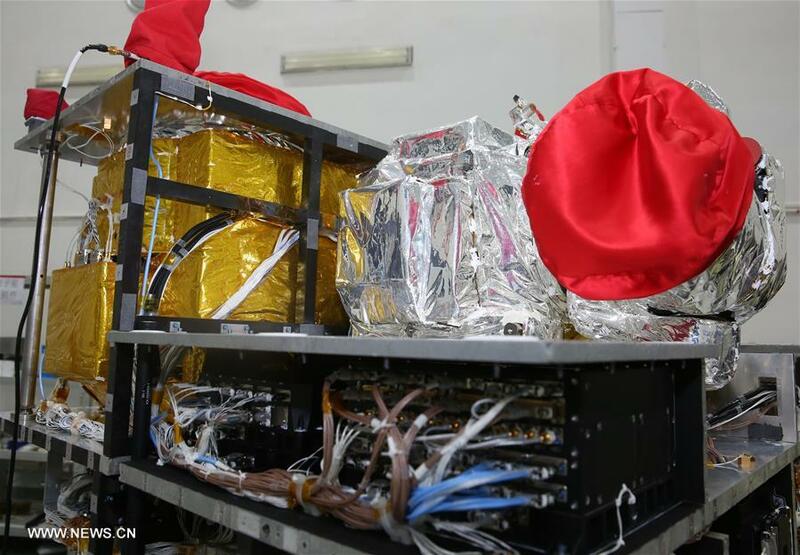 By mid-2013, the first prototypes of QSS payloads were completed and underwent electronics characteristic testing. 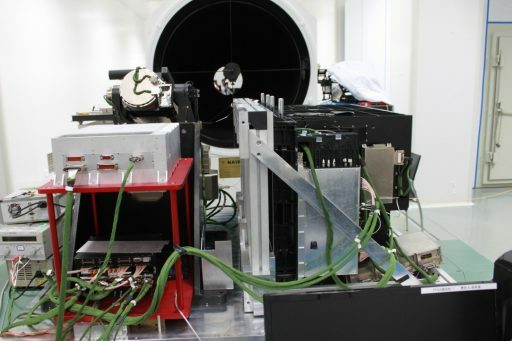 A ground test model of the satellite structure was finished by October 2013 for mechanical environment simulations followed by thermal testing. The joint payload systems headed into testing in 2014 before the flight units were manufactured for integration on the satellite bus. Because quantum communications are a sensitive new technology, information on the design of the QSS payload are not available. The two-year primary mission is expected to deliver the data needed for an assessment of the feasibility of establishing a constellation of up to 20 satellites to generate a quantum communications network with global space-to-ground communications coverage – a major step towards establishing a quantum internet. QSS, if successful, may become a trigger for other nations to invest in the development of quantum communications systems for the government and private sector.